Will there be a gold iPad 5 and iPad mini 2, too? What colors will the iPad mini 2 come in? The iPad 5 is rumored to be suiting up for travel to "space gray" in October, and it looks like Apple's smaller 7.9-inch tablet may be in a matching outfit. That makes sense since we know that the iPhone 5S just launched in space gray, silver and the extremely rare gold. But that has literally become yesterday's news. Today's leaked photos from NowhereElse.com moved on to focus on the iPad mini 2, which allegedly depicts the tablet in the most plentiful, least desired iPhone 5S space gray color. 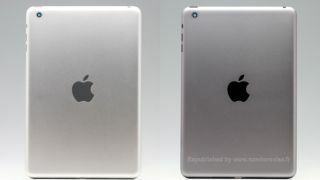 A purported space gray iPad mini 2 shell is shown in composite photos along with the also unconfirmed silver iPad mini 2, a color the back half of Apple's tablets have been sporting since first launching in 2010. Will there be a gold iPad? The silver iPad mini 2 reportedly leaked in a comparison video that showed a shell not very different from the first iPad mini. The changes are thought to involve a high-resolution Retina display. And now we are seeing this space gray iPad mini shell. That begs the question: Will there be a gold iPad 5 and iPad mini 2? There was certainly pent-up demand for the precious-looking gold color when the iPhone 5S launched Sept. 20. Availability has since been pushed back to October. Apple may be toasting to more profits as a champagne colored iPad 5 and iPad mini 2 could grab more headlines very soon. All Touch ID-sensed fingers are pointing to an October launch for the tablets.